At some point, we have all question our life choices and career paths, some days more than others. Embarking on a journey as an SEO makes you question your decisions more often than not. At the worst of times, I wish that I am averagely smart and 100% ignorant which would allow me to live out my day s in bliss oblivious of bad web choices, arrogant requests while preparing for the harvest of the season (yes I picture myself being farmer). But why so glum? With servicing a large number of sites come an enormous amount of tedious statements about SEO that is so wrong it makes us die a little inside each time we hear them. For such a new career path an enormous amount of mythology has been built up around how SEO works and what is realistically achievable. With that note, I have put together a list of the top SEO Myths that make us question our very existence. Yes, raking is important, but you don't have to rank number 1 for just one, 1-dimensional keyword. This is 2017 and search results are now based on intent and personalised according to your interest profile. Chances are you are getting more traffic from a combination of long-keywords as opposed to that single keyword you are fixated on. We all agree that content is King, but behind every great King is his Queen and SEO is that Queen. Great content alone won't bring you the traffic, but throw in some SEO and watch the magic happen! The only official worthless meta tag is the Keyword Tag. Titles and descriptions are like the windows to your website's soul. These entice the user to click through to your site, neglect these nads you will miss out on a significant amount of traffic. Every good SEO knows that to truly make this channel work, you cannot work in isolation. Usability signals were a part of SEO even before UX became so popular. No point in having these best content but your site takes 3 minutes to load. This will annoy both search engines and users and compromise your potential visibility. Prioritise your efforts and optimise your UX. Google hates SEO as much as every little girl hates unicorns. In fact, Google published one of the first comprehensive guides to SEO encouraging webmasters to implement best practices aiding their sites to gain maximum visibility. They also have tons of material on best practice website criteria which heavily draws on SEO practices and have created tools such as Google Webmaster Search Console which allows SEO to track their efforts and flag health risks. The truth of the matter is that Google encourages website owners to implement SEO practices on their sites. In this way, they can weed out the good from the bad quite easily. There has never been an official accreditation for a Google certified SEO individual or company. There are Google certified partners (which is mainly based on Google Adwords and Analytics accreditation) and official Google photographers but no official SEO accreditation. This statement could not be more wrong. Social signals are one of the more leveraging ranking factors that can help increase the visibility of your pages. The more users engage with your pages, like share on social and comment, the more relevancy signals will be placed on your webpage. We often get requests for SEO once off packages, and we highly recommend this if you don't have much budget to ensure the bare minimum is in place. However, the effects will be as the efforts, a minimum. SEO is a process that needs to be constantly worked on and refined, especially if you have a large offering. Fresh content is key, and we have to make sure that evolving algorithms are accommodated. Guest posting might be a time-consuming process but saying it doesn't work is the real lie. 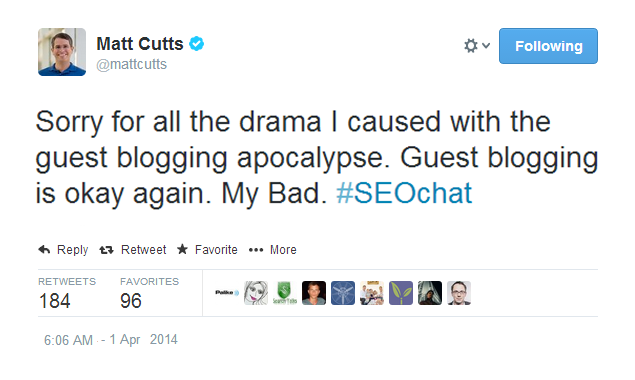 This is stemmed from an announcement that Matt Cutts made, which he retracted a few days later. Despite the unsincere statement above Guest posts, blogging can benefit more than doing harm. Not only can it expose tour brand to a different audience segment, but it also creates a wider reach for your content and opens up an avenue for potential customers. It also positions your brand as an authority in the featured subject matter and you will prob score a link or two back to your site. In conclusion, Guest Posts can only benefit your Brand. If you really believe this you should check your pulse and brain activity to make sure its functioning and you not in fact brain dead! SEO was foretold to kick the bucket a long time ago, and with the rise of UX and content marketing gaining their own specialities in the digital spectrum, this statement has been more frequently used. The truth of the matter is that SEO is the backbone of any great marketing strategy. It is not dead but has become more and more complex over the years with the rise of each new algorithm. With more big players investing heavily in SEO, its also become more competitive. And if you want your website to reach its maximum visibility potential online, there is no better long-term investment than SEO. If you have any more myths, you would like to contribute or any questions about SEO, comment below or contact us here!